^ Witchcraft at Salem Village. Pioneers in the Settlement of America by William A. Crafts. Vol. I Boston: Samuel Walker & Company, 1876. Artists: F. O. C. Darley, Wm. L. Shepard, Granville Perkins, etc. ^ Jewett, Clarence F. The Memorial History of Boston: Including Suffolk County, Massachusetts. 1630–1880. Ticknor and Company. 1881: 133–137. ^ The Glorious Revolution in Massachusetts: Selected Documents, 1689–1692 (henceforth cited as Glorious Revolution), eds. Robert Earle Moody and Richard Clive Simmons, Colonial Society of Massachusetts: Boston, 1988, p. 2. 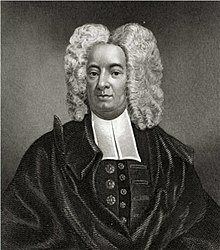 ^ "Letter of Increase Mather to John Richards, 26 October 1691, Glorious Revolution p. 621. ^ Sewall Diary, p. 291. ^ Massachusetts Archives Collections, Governor's Council Executive Records, Vol. 2, 1692, p. 165. Certified copy from the original records at Her Majestie's State Paper Office, London, September 16, 1846. ^ Governor's Council Executive Records, Vol. 2, 1692, pp. 174–177. Goss, K. David (2007). 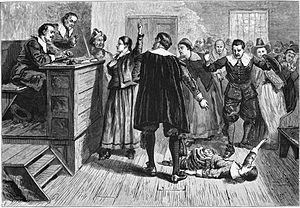 The Salem Witch Trials: A Reference Guide. Greenwood Publishing Group. ISBN 0-313-32095-0. Spanos, N. P., J. Gottlieb. "Ergots and Salem village witchcraft: A critical appraisal". Science: 194. 1390–1394:1976.